Would you be surprised to learn that you don’t need more money than you currently earn? We often assume our financial troubles will disappear once we get an increase, win money or inherit a hefty amount. Sadly, our bad financial habits tend to follow us around, regardless of how much we earn. This section is dedicated to helping you take control of your finances. Learn how to take control of your debt, to budget and understand the true impact of bad habits like impulse purchases. You probably won’t end up swimming through your money like Scrooge McDuck, but before you know it, you’ll have the satisfaction of watching your money grow. Before making your first investment, you need to have a solid financial foundation. The longer you invest your money, the more your money will grow. Your financial foundation will ensure you can hang on to your investments long enough to help them grow. In this section we discuss the building blocks that will help you become investment ready. We start with the importance of tracking expenses before we tell you exactly how to put together your own budget. Next, we help you figure out how to finally get a handle on your debt. Lastly, we discuss the importance of the right type of insurance and help you work out how much cash you’ll need in your emergency fund. If you need more help, listen to these podcasts. How to structure your pay cheque: Part One and Part Two. If someone had to ask you what you spent your salary on last month, would you be able to tell them? Money has a strange habit of falling through the cracks. It’s okay if that happens to money you set aside for fun, but it can be a problem if you can’t cover all of your expenses. Drawing up a budget will help you figure out the best way to spend your money. Why does the idea make me nervous? You might resist the idea of drawing up a budget at first. Many people feel so overwhelmed by their financial situation that they prefer not to think about it. To get through the initial budget jitters, start by writing down everything you spend for one month. You can use an application (we love how 22Seven does everything for you), or carry a notebook with you. Keep track of what you bought and how much it cost. How will writing everything down help? Writing down what you spend will help you get a sense of your habits. Once you know where your money goes, you have an outline for your budget. Need a little help? Use our Leaky Bucket tool below to figure out what you’re spending your money on. It’s time to figure out where all your money goes. Remember, no expense is too small to log. Once you’ve tracked your spending for a month, you should be able to identify the different things you spend your money on. You budget should account for all of those things – even the things that you think you shouldn’t be spending money on. Why do I have to budget for spending money? Just because you know you shouldn’t be spending money on something, like eating out, doesn’t mean you’re going to stop doing those things. When you don’t include things you enjoy in your planning and end up doing them anyway, you’ll feel like you failed at budgeting and give up. Does that mean I can always buy what I want? Sadly, no. It’s a good idea to add the things you like to do to the bottom of your budget. Once you’ve allocated money to all the boring, grown-up expenses like rent and savings, whatever is left over can go towards treating yourself. What if there’s not enough money for the things I want? You could get to the end of your budget and find you have no money left to treat yourself. This is normally a sign that you should simplify elsewhere. Take a long, hard look at your budget. Are you paying for things you don’t really use? Are you paying too much rent because you live in a nice area? Remember, cutting out unnecessary expenses frees up money to do the things you really enjoy. Isn’t that what you would like to spend your money on? Why is cash on the list? Cash can be tricky in a budget. You might intend to use it for eating out, but end up paying for parking and a on-the-go coffee instead. It’s a good idea to draw an amount at the beginning of every month to keep on you for cash expenses. What if I can’t stick to my budget? Drawing up a budget is not a guarantee that you will stick to it. Don’t let that discourage you from drawing up a budget every month. Knowing exactly what is going on in your finances will enable you to make better decisions about your spending. Over time, it will become a habit. Don’t give up hope! What do I do about debt? Whether you have good or bad debt, paying off debt reduces the amount of money you have left in the bank to spend on things that you really need or want. If, for example, you owe money on an in-store clothing account, you have to pay the amount you owe the store every month to prevent getting a phone call from the store and a bad credit score. If you didn’t have that debt, you could have used the money to buy things, to save or to invest. We’ve dedicated an entire section of this website to help you figure out a plan to deal with your debt. Become a Debt Buster here. Few people love the idea of buying insurance. You would probably prefer spending your money on something that makes you happy. However, insurance products are designed to protect you financially when life isn’t going according to plan. Do you know what you would do if your house burned down? Aside from the emotional shock of such an event, would you be able to afford replacing some of what you had lost? If the answer to that question is no, you also can’t afford to start making investments. Certain insurance products protect you against short-term setbacks, such as falling ill or getting into a car accident. Other products are designed to replace your income should you become permanently unable to work due to illness or disability. In South Africa, it’s worth having a medical aid. Ensure that you choose one that will cover your medical expenses even when you are low on cash. Remember to claim back cash payments from the medical aid. You also need short-term insurance on possessions that are expensive to repair or replace, like your car and the contents of your house. Remember, the objective is to avoid selling your investments too soon. Having investments won’t help if you lose your ability to earn money too soon. Unfortunately accidents happen and people get sick, so you have to take out an insurance product that will replace your salary if you can no longer work. Dread disease and disability insurance pays out under certain conditions to help you deal with the costs. For example, if you get cancer, this type of insurance pays out to help you pay for the treatment. Income replacement products pay out if you can’t work due to an accident or sickness. These products pay out for as long as you’re unable to work. Life insurance products pay out to your family in the event of your death. These products are especially important if members of your family rely on your income to survive. If you have small children, these products can be set up to cover their school fees and living costs until they are old enough to support themselves. If you are married, ensure that your spouse also has one of these products so you have some financial help if your spouse passes away. The right insurance is critical, but that doesn’t mean you should buy the first product you can find. We’ve compiled a list of questions to ask insurance providers to find the best possible value for money. As a rule of thumb, get three quotes that cover all of the below, and then go with the most affordable one. How many doctor’s visits are you entitled to per year? Will your chronic medication be paid in full? Does your doctor have to belong to a special network? What is covered in emergencies? Does your medical aid pay for ambulance trips? What is covered when you visit the hospital? Are MRI and CT scans covered? What type of cover do they offer in case you get cancer? If you or your partner fall pregnant, what will be covered relating to the pregnancy? If you have a baby, will the baby be covered by the medical aid? Which diseases or treatments aren’t covered? Are there any contents that aren’t covered by the insurance? What percentage of the value of each item insured will be paid out in case of a claim? How much would your co-payment amount be? Will the insurer update the value of your house every year? Are you covered for events that happen outside of your home, for example if a laptop gets stolen from your car? Is there anything you can do to reduce your premiums, like installing an alarm system or appointing an insurance company? Which items should be specified to be covered? Will they send an independent assesor to help value your belongings? Will they cover second properties, like holiday homes? Will your insurance pay out if an incident occurs when you’re not home? How much of the damage to another person’s car will be covered? Are there situations when your insurance won’t pay out? For what amount will your car be covered? Are there ways to reduce your premiums, such as storing it in a locked garage and installing a Tracker device? What will your co-payment amount be? How much of the value of your car will be paid out in the event of an accident? How much will be paid out if your car gets stolen? Will your insurance pay out if your car catches fire? How long is the waiting period before the policy pays out? Will the policy pay out a lump sum, a monthly income replacement amount or a combination of both? Am I covered for my current position at my current salary or for similar positions in my field? Will the income replacement amount be adjusted for inflation? Will the product pay out my full salary for the full period, or only a percentage of my salary? Does the policy include a retrenchment benefit? Which diseases and disabilities are covered? Are you covered for a pre-existing medical condition? Will the policy pay out a lump sum or a monthly payment? How much are you covered for? How much will you receive if you become permanently disabled? Does having a medical aid affect how much the policy pays out? How many of my dependents are covered by my life insurance? How much money will my dependents receive? How long after my death will my dependents receive a payout? Does the insurance lapse when I reach a certain age? Does the life insurance payout become part of the estate, or is it paid out seperately? Are there any conditions under which the policy won’t pay out? Does the premium amount increase every year? Do I need to go for regular medical checks to receive a payout? Even with the right mix of insurance products, you need to have access to cash in emergency situations. If you get fired from your job or the company you work for shuts down, you will need to cover your expenses, including your insurance products, until you can find another job. To give yourself enough breathing room to deal with such emergencies, you need to have enough money to pay all your expenses for three months with your savings. Emergency funds are also handy for bigger expenses, like putting a deposit on a home, as long as you remember to save enough again to cover your expenses for three months. OUTstanding money: What is a stock exchange? 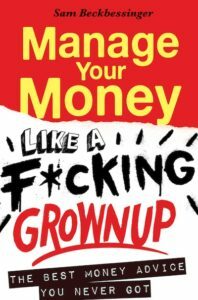 Manage Your Money Like a F*cking Grownup by Sam Beckbessinger is an excellent resource to help you get your financial foundation in place.